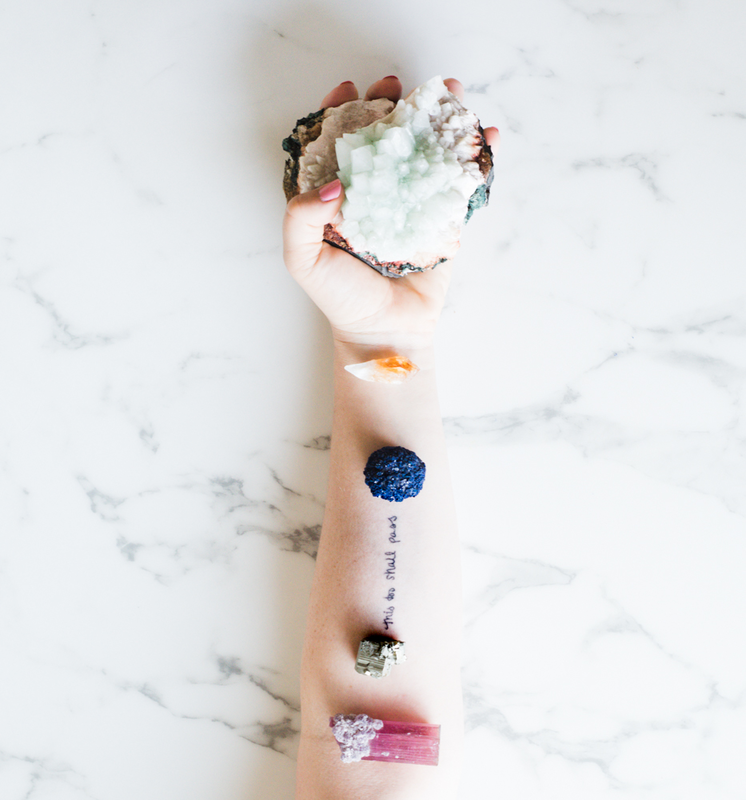 Last Month, we started a journey through the vast and wonderful world of crystals and their corresponding astrological signs. For a full recap of the first six zodiac signs, please refer to Part one of this series. We’ll continue our exploration with Libra, the start of the second half of the zodiac. Each astrological sign holds certain qualities, or attributes, which fill our atmosphere with energy. Each quality, like love or courage, vibrates energetically at a certain frequency. Crystals, too, hold a certain energetic vibration. 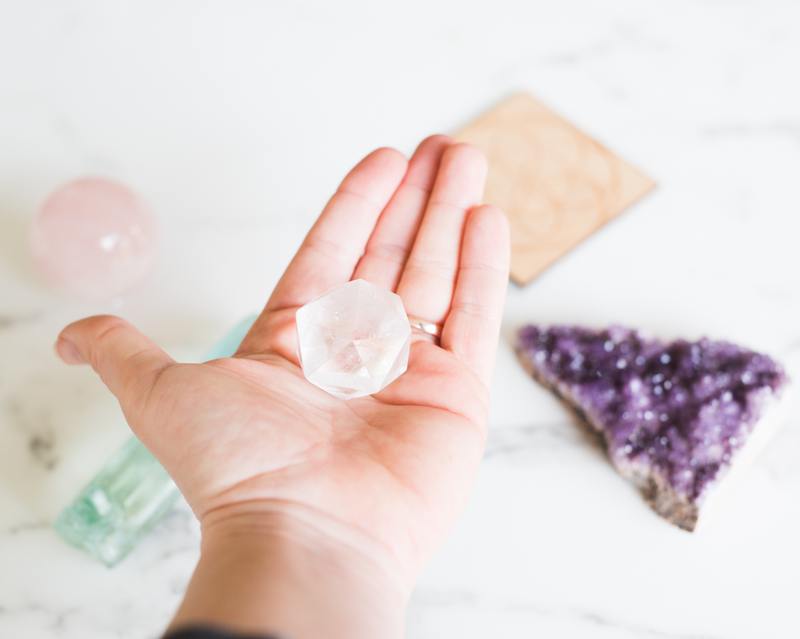 To align with any astrological quality, not just your personal sign, we can use crystals to help us call in the vibration we want in our life. For instance, if we want the quality of peace, known to Libra, we can hold, or sit with, a crystal that vibrates at the same level. By tuning our energetic frequency with the crystal, we can align with the astrological sign of our choosing. Additionally, we can use crystals to balance energy. During any astrological season, like Aries, the one we are currently in, we can further enhance the energy already present in the atmosphere and balance it with our own frequency through the use of crystals. Crystals can also help balance our personal energy. If you are a Taurus, for instance, crystals that resonate at the same frequency as Taurus’ attributes can help balance the low and high sides of the Taurus energy. We’ll go through the remaining six zodiac signs and list which crystals help call in, or align with, the energy so it is more present in your world. We’ll also list some crystals what will help balance the astrological energy should it become unbalanced within your own energy. Libra is the peaceful warrior of the zodiac. She fights for justice through her illumination of what is right and fair in the world. She teaches us how to live in a world with other people and treat everyone as we would treat ourselves. She governs our relationships, our partnerships and our ability to navigate these domains with peace, balance and tranquility. To call in the truth and wisdom inherent to Libra’s energy, meditate with Lapis Lazuli, holding it in one hand as you clear your mind. To bring balance back to yourself and integrate your masculine and feminine energy, use Watermelon Tourmaline. You can wear this crystal, mediate with it, or simply have it near you. If you need to restore peace back to your relationships, use Kyanite, a crystal that removes negativity from any situation and restores tranquility. From the peaceful air of Libra, we jump right into the depths of our shadows with Scorpio. Known as the sign of transformation, Scorpio encourages us to be fearless in the pursuit of what lies beneath our conscious mind. Scorpio is the sign of the shaman, the magician and the sorceress. The crystals that correspond to her energetic vibration bring about powers of alchemy while protecting from negative energy, which often accompanies this type of work. To align with power inherent to Scorpio, while remaining grounded in this realm, use Obsidian. You can gaze at it, hold it, or have it near you as you work. To balance any fear that may come up as you face the depths of your soul, use Black Tourmaline, known to stabilize fearful energy and protect against negative thinking. Shungite is another excellent stone for working with Scorpio’s energy. It will bestow the wisdom of the universe to whomever is near it. From inner expansion we move to outward expansion. Sagittarius is the sign of the jolly traveler, happily exploring the world in search for truth and knowledge. Sagittarius seeks new experiences to learn from, to grow from and to ultimately teach. She does not judge anything as positive or negative, she views it as experiences with life itself. To align with the spirit of adventure, have some Aventurine, a crystal of luck and coincidence. Carry it with you as you travel to call in serendipitous experiences along your journey. If you are prone to stress or anxiety while in a new environments, have some Red Jasper with you to soothe your mind and keep you calm as you traverse new territory. Turquoise is also an excellent stone to have with you on travels, as it provides protection to your personal energy. Try wearing some on your next trip to keep your energy safe. From the exploratory energy of Sagittarius we meet focused and determined Capricorn. Tenacious and stubborn, Capricorn gives us the energy we need to overcome any obstacle and stay the course of our destiny. She is prone to solitude and reminds us that all the answers we seek are in our own mind. We just need to find some peace and quiet to listen to them. To align with the focus of Capricorn, use Fluorite, a crystal which brings structure to our thoughts and clears our mental confusion. Garnet is also an excellent stone for aligning with the grounded and practical nature of Capricorn. Have some near you when meditating or when trying to bring clarity to your thoughts. Malachite is another crystal which will bring mental clarity. It is particularly useful if you are doing something highly technical, as it will prevent you from making mistakes. From the grounded Earth of Capricorn we enter the freedom loving air of Aquarius. Always ready to stand up for what she believes in, Aquarius knows who she is and what she wants. Her energy encourages us to tap into our personal power and use our voice to express ourselves. Aquarius energy inspires courage, progressive problem solving and radical thinking. This is the energy of revolution, confidence and knowing oneself. To align with the energy of confidence, use Goldstone, a crystal which will bring you right to your core essence. To instill progressive thinking and get you “out of the box”, use Peacock Ore, a wonderful crystal to expand your spirit and balance your energy. To align with your independent spirit, use Kambaba Jasper, it will keep you calm as you pursue your personal freedom. Form the free air of Aquarius we expand even further into the all encompassing waters of Pisces. Known for her laid back, go with the flow attitude, Pisces is the sign of the Ocean. She is vast, deep and capable of softly molding her surroundings. Pisces teaches us that there is power and healing in sensitivity, and there is wisdom in being of service. She is formless, in every sense of the word, and reminds us that there is no you and I, there is only us. To help raise your awareness and vibration to this beautiful level, use Angelite. This crystal will amplify your intuition and connect your with your higher guidance. To help access your innate powers of healing, use Labradorite, a crystal which helps transmute your intuition into practical applications. Amethyst is also an excellent stone for helping to balance any anxiety that may come from going with the flow. Use it to calm your mind so you can accept your life’s path instead of fighting your dreams. That completes our journey around the zodiac wheel. Remember you can tap into any energy you’d like at any time. It’s all available to you, as it’s always in our sky and in our atmosphere. You do not need to be a sign to hold its vibration. Use these crystals to help you align with any quality, or vibration, when you need it. 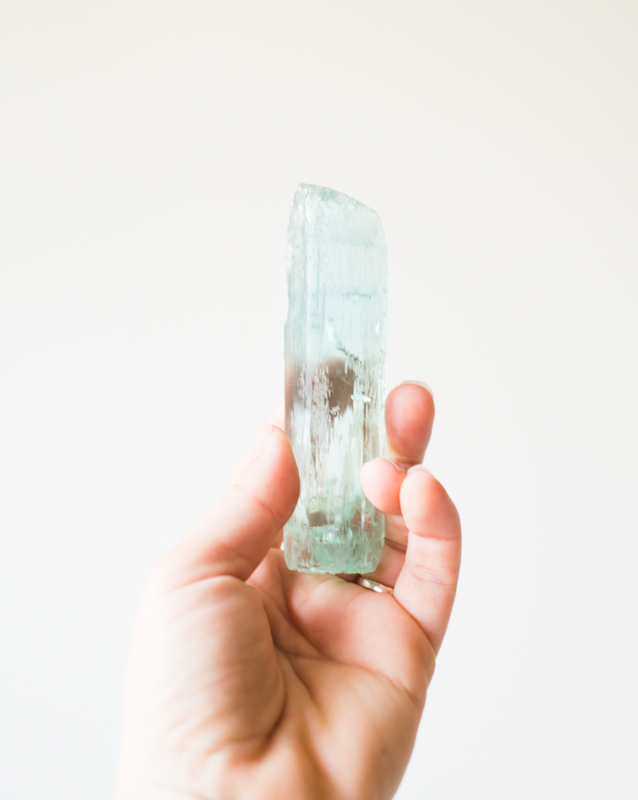 You can meditate with the crystals, wear them, gaze at them or simply have them near you. They are magical beings that bring you to your most magical self. All you have to do is believe, open yourself and your energy to their power.